Proportionate to the area they cover, coral reefs support more fish biodiversity than any other habitat in the oceans. However, they are also among the most sensitive habitats to changes in climate. A phenomenon called ‘coral bleaching’ occurs when environmental stress causes the corals to expel their symbiotic algae, called zooxanthellae (Figure 1). Zooxanthellae, live inside the tissues of corals, providing the corals with sugars created through photosynthesis. In return, the zooxanthellae are provided with safety, nutrients, and an elevated position in the water column for more efficient photosynthesis. When this happens, the zooxanthellae leave the coral, ending its symbiotic relationship and causes the coral to lose its pigmentation (Figure 2). 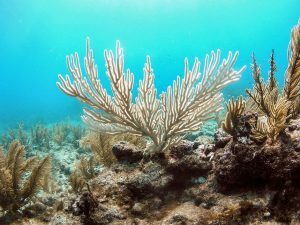 Corals can survive bleaching if another species of zooxanthellae replaces the ones that leave, and some researchers speculate that bleaching is a defense mechanism that allows corals to evict their old tenants to create vacancies for hardier species of zooxanthellae that can handle the new environmental conditions. If other zooxanthellae do not take its place, the coral will die. 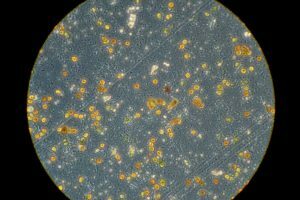 Scientists fear that the rate at which ocean temperatures are rising is not allowing corals enough time to allow new zooxanthellae to colonize after a bleaching event, leading to massive die-offs in some parts of the world. However, new research is offering a glimmer of hope for the future of coral reefs. Thomas DeCarlo from the University of Western Australia and his colleagues made a surprising discovery that some corals may be more resilient to rising temperatures than previously thought. Because corals grow in layers, you can discover all sorts of things by looking at a core of its skeleton, from the age of the coral to the conditions of past oceans. Using cores from the skeletons of a long-lived species of coral (called Porites), the team was able to look into the past by searching for ‘stress bands’ which are abrupt and discrete changes in the structure of the skeleton that indicate past bleaching events. They collected skeleton samples from 14 reefs across the Great Barrier Reef, the Coral Sea, and New Caledonia and were able to look for bleaching events as far back as 1815 (as old as their oldest skeleton was). Unsurprisingly, they found that bleaching was highly infrequent during pre-industrial years but started to occur regularly beginning in the mid-twentieth century. However, what was surprising is that the proportion of cores that had ‘stress bands’ has actually declined in recent years, which leads the team to speculate that this species of coral is acclimatizing to the new warmer ocean conditions. It remains to be seen if other species of coral can acclimatize like Porites, or if they can acclimatize at a rate which keeps pace with global warming. Furthermore, other scientists have projected that by 2050, 1.5-2.0°C of warming could put up to 98% of coral reefs at risk of annual bleaching (Schleussner et al. 2016). All in all, future projections for coral reefs in a world affected by climate change have been pretty grim. However, it is at least comforting to think that some corals could survive in a world that will be fundamentally changed by global warming. DeCarlo, TM, Harrison, HB, Gajdzik, L, Alaguarda, D, Rodolfo-Metalpa, R, D’Olivo, J, Liu, G, Patalwala, D, and McCulloch, MT. Acclimatization of massive reef-building corals to consecutive heatwaves. 2019. Proceedings of the Royal Society B. 286: 20190235. Schleussner, CF, Lissner, TK, Fischer, EM, Wohland, J, Perrette, M, Golly, A, Rogelj, J, Childers, K, Schewe, J, Frieler, K, Mengel, M, Hare, W, and Schaeffer, M. Differential climate impacts for policy-relevant limits to global warming: the case of 1.5°C and 2°C. 2016. Earth System Dynamics. 7: 327 – 351.